(leading to ExpertRating Luscious, Low-Fat, Lightning-Quick Meals Skills Certification). You'll discover how to get in and out of the kitchen faster, including tips for grocery shopping, menu planning, food preparation, and quicker cooking. 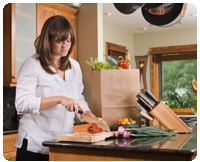 You'll also learn a dietitian's tricks of the trade for encouraging reluctant family members to eat more healthfully. You'll have the chance to try out over 50 exciting and easy lowered-fat recipes for tasty entrees, side dishes, desserts, and garnishes, with each recipe demonstrating a topic that's covered in the lessons. This course includes a knowledgeable and caring instructor who will guide you through your lessons, facilitate discussions, and answer your questions. The instructor for this course will be Donna Acosta. About the ExpertRating Online Low Fat, Quick Cooking Classes Course instructor : Donna Acosta, RD, is a registered dietitian and nutrition educator. Her clinical expertise is in weight management, diabetes nutrition care, and cardiac rehabilitation management. Donna also has many years' experience teaching cooking classes, which reflects her passion for eating healthfully—and enjoying every bite! She has developed and taught a variety of hospital- and community-based nutrition programs, including such clients as Warner Bros. Studios, Neutrogena and Fluor-Daniel. As the wife of a husband with type 2 diabetes and the mother of three young children, Donna's focus is on helping others discover how feasible and delicious it can be to eat healthfully for a lifetime. Luscious, Low-Fat, Lightning-Quick Meals requirements: For taking this instructor led ExpertRating Online Low Fat, Quick Cooking Classes Course you need Internet access, e-mail, and the Microsoft Internet Explorer or Mozilla Firefox Web browser. "Class was fabulous! I learned new cooking techniques, organized my kitchen and lost 15 pounds!!" "Donna, I would like to thank you for a great course! I really enjoyed making the recipes and your advice has been very helpful and inspiring!" "Donna, thanks to you and this super course, I now have a renewed interest in cooking and many wonderful recipes yet to try. The recipes from my new "Cookbook" are going to be staples. I'm anxious to develop a cycle menu so I can continue to enjoy eating healthy." "Donna, thank you for such a wonderful class. I must say I think my husband enjoyed it much more than I did, and I really enjoyed it! I have learned so much through your teaching and hope to continue trying new dishes incorporating the valuable information you have provided. I have a lot of recipes yet to try from the class. Again, thanks for an excellent cooking class." "Donna, you are a wonderful teacher and I have really enjoyed this course! It is the first time I have taken an online class and it was a lot of fun, so I plan to take more in the future. I will watch to see if you have another class and would like to join you again :)!" "Great course, lots of helpful information. The instructor is passionate about nutrition and it shows in her course content." "Great work! Keep it up...I was more than pleased! Thanks again for a great class!" "I am an active member of a weight loss group and found this information invaluable! The course also helped me look at my family's diet and easy ways to improve it. Thank you!" "I enjoyed the course very much. This was my second on-line class the first was [from another provider]. This was much more fun and relaxed. I have learned a great deal and began applying some of the things I learned almost immediately. I look forward to another class as well as preparing the many recipes I have not yet prepared. I think I will read through my printed copies of the lessons often. They are jam-packed full of important information." "I have enjoyed reviewing the recipes, and selecting different recipes, actually cooking them. I have gained a little more knowledge & a lot more confidence in trying to cook healthy. Thank you." "I really enjoyed the class & I feel I learned a lot." "I enjoyed this class very much and look forward to the opportunity of doing another online class...I have noticed my shopping has changed and how I now try harder to find low sodium and low fat products. I have also become more aware of the importance of seasoning. When I prepare something not from this class, I have a better understanding of why the ingredients have been put together. I hope there will be a follow up class with more information...I must admit, I wondered how a cooking class could be conducted online. It worked out great! In fact, I think it was better than it would have been if we had had to go to a specific location twice a week for a lecture. Thanks for everything. My husband benefitted from the class also and appreciates all the new recipes." "I found this course to be very enjoyable and hate to see it end! I'd be very interested in another course with this instructor." "I have taken several classes and this was the best one. I hope there are more foods and healthy cooking classes. I extremely enjoyed this one and the instructor was excellent." "I really enjoyed this course. The recipes were delicious as well as healthful. 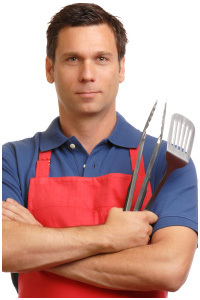 I have learned many ways to improve my cooking, marketing, and housekeeping." ExpertRating is one of the world's only ISO 9001:2015 Certified companies (from TUV America) offering an Online Low Fat, Quick Cooking Classes Course (leading to ExpertRating Low Fat, Quick Cooking Classes Skills Certification). When you choose the ExpertRating Online Low Fat, Quick Cooking Classes Course you can be sure that you are buying a premium International certification that is recognized by hundreds of employers and Government bodies in the US and other countries. With ExpertRating you get certified quickly online and you are equipped with a store house of information through the in-depth ExpertRating Online Low Fat, Quick Cooking Classes Courseware which has been developed by experienced chefs. The ExpertRating Cooking Certification is by far the best value for money instructor led Cooking Program at $129.99. You can buy this ExpertRating Online Low Fat, Quick Cooking Classes Course leading to Cooking certification at a special offer price of only $129.99 which includes the in-depth ExpertRating Online Low Fat, Quick Cooking Classes Courseware and exam fee. This is the best value for money Cooking Program available till date. You get the following services within the USD $129.99 fee. 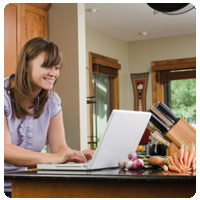 In-depth ExpertRating Online Low Fat, Quick Cooking Classes Courseware including scenarios and case studies. World wide airmail delivery of the hard copy Cooking Certificate. 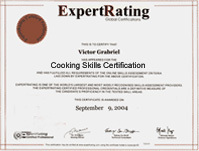 The Cooking Certificate can be used to prove your certified status and does not mention the words "online". The process of getting yourself certified is very simple. All you have to do is buy the ExpertRating Online Low Fat, Quick Cooking Classes Course for $129.99. Log in to the instructor led course using your password. Go through the ExpertRating Online Low Fat, Quick Cooking Classes Courseware (which would take you 6 weeks) and complete the final Cooking Certification exam at your convenience. You can complete the exam within 2 months of buying the Cooking Certification. The result of the exam appears as soon as it is completed, and your Cooking Certificate is mailed immediately. Cllfter assignments to help you practically use the Cooking that you will learn during the course. The final exam is fully based upon the ExpertRating Online Low Fat, Quick Cooking Classes Courseware that is provided along with the Cooking Certification. If you have gone through the courseware properly you should not have a problem clearing the exam. The exam consists of multiple choice questions from all cllfters of the ExpertRating Online Low Fat, Quick Cooking Classes Courseware. 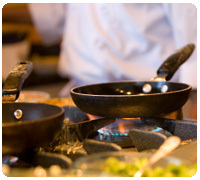 Explore how to use flavor profiling to expand your culinary horizons. 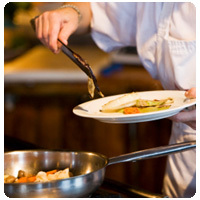 Have you ever wished you had a personal chef preparing luscious, low-fat meals for you? This course is the next best thing! You'll learn how to ferret out fat in recipes, and discover how to reduce fat without sacrificing flavor or texture. Learn how to prepare casseroles, crock-pot dishes, vegan dishes, oven-fried foods, meat-based meals, and many other entrees that are both nutritious and delicious! Low fat food can be tasty as well as made as quickly as any other food. 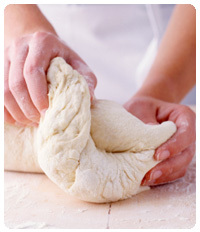 The important thing to remember about any food and most importantly low calorie food is the right kind of ingredients. Have you always suspected the only function of fat was to attach itself to your stomach, hips, or thighs? The first lesson will uncover the functions of fat in cooking and discuss easy, lower-fat ways to replace these functions. In this lesson you'll begin to identify high-fat ingredients in recipes, too. You'll use your new skills to prepare a luscious—and lowered-fat—recipe for Lasagna Mexicana. Then you'll try your hand at a quick-and-easy Chicken à la King that's lower in fat but even more flavorful than the original recipe! In Lesson 1, you learned that two of the functions of fat are carrying flavor and adding "mouthfeel." Seasonings are a fat-free way to improve flavor and mouthfeel. This lesson will explore the functions of seasonings in lowered-fat cooking, and then it will discuss several of the most commonly used seasonings and their uses. You'll also learn about flavor profiling, and use this terrific technique to create three easy, flavorful lowered-fat recipes: Mexican Shepherd's Pie, Greek Pizza, and Italian Meat Loaf. Many recipes are based on sauces, and many of them tend to be high in fat. This lesson will look at the functions of fat in sauces. It will discuss several ways to make easy and delicious lowered-fat sauces. You'll use this knowledge to prepare an easy, elegant Fettuccine Tofredo with Chicken and Broccoli that's deliciously smooth and rich. You'll learn how to use canned condensed soups to make easy low-fat sauces when you make Quick and Easy Turkey Tetrazzini. And you'll discover the differences between opaque and glossy sauces as you learn to prepare quick and easy recipe for Sweet and Sour Chicken. This lesson is a student favorite! This lesson will define add-in ingredients, and you'll discover how to incorporate them into delicious lowered-fat recipes. Armed with this knowledge, you'll prepare a kid-friendly Spaghetti Pie that adults will love, too! If you enjoy Asian cuisine, you'll be delighted with this lesson’s 15-minute recipe for Spicy Peanut Chicken. You don't have even 15 minutes to make dinner? After you apply your knowledge of seasoning, flavor profiling, and add-in ingredients, no one will believe you made Very Veggie Soup using canned and frozen foods. Last but not least, this lesson will share with you the alterations made to a typical restaurant-style fried rice recipe to create unforgettably delicious "Fried" Rice. Have you sworn off red meat because it's too high in fat or it's too difficult to prepare tender and flavorful cuts of lower-fat meats? Are you sick to death of the same old recipes for chicken? If you answered yes to either question, you'll love this lesson! You'll uncover many tips and tricks for preparing tender and flavorful meals based on leaner meats when you prepare Ground Beef Stroganoff, Pan-Broiled London Broil, and Sweet and Sour Meatballs. This lesson will revisit flavor profiling as it explore rubs and marinades, two great ways to enliven plain old poultry. To showcase these skills, you'll prepare Cinnamon Chicken. And finally, you'll discover how to convert a time-consuming recipe for Chicken Cordon Bleu into a quicker, easier, and lower-fat casserole recipe. Seafood offers so many health benefits that several health organizations recommend eating it at least twice a week. Many people avoid fish and shellfish because they aren't familiar with how to prepare it or they're not excited about filling up the kitchen with that fishy aroma. This lesson will discuss how to choose seafood, and you'll learn how to prepare a bounty of fish and shellfish-based meals that won't leave your house smelling funny, including Grilled Ginger-Lime Salmon with Sauce, Drunken Cod, Poached Asian Salmon, Fish Puttanesca, Thai Shrimp, "Crab" Salad, Quick Crab Bisque, and Asian Tangerine Scallops. Are you suspicious of soybeans? Any doubts you may have will be dispelled when you taste Marinated Three-Bean Salad and Farmer Chili. Are you baffled by tofu? You'll discover how easy it is to use it to replace high-fat ingredients like cream and whole eggs when you prepare Creamy Butternut Squash Soup, Pasta Carbonara, Spicy Peanut Tofu, Tofu Pumpkin Custard, and Tofu Guacamole. As easy and delicious as these recipes are what most students enjoy about this lesson is sneaking healthful soybeans and tofu into their family's meals. Your diners will never be the wiser, either! Are you tired of never having an answer to the question, "What's for dinner?" If you shouted "Yes!" then this is your lesson! Even if you usually have dinner under control, you'll be delighted to learn how to develop and use cycle menu to save you time, reduce food waste, and help encourage diner acceptance. To prove these points, in this lesson you'll learn to prepare Bean and Basil Salad, Tomato-Basil Meat Sauce, Chicken Curry, Shrimp Cashew Salad, and Greek Skillet. This lesson will also discuss how to develop a grocery list that works for you. It will finish up by taking a look at shopping for groceries, including the pros and cons of online and warehouse shopping. Break out your Crock-Pot and discover how delicious and easy lowered-fat cooking can be! This lesson will prepare an exotic but oh so easy recipe for African Chicken. You'll learn how to convert the Chicken à la King recipe that was prepared back in Lesson 1 to a Crock-Pot recipe. This lesson will uncover the secrets of lowered-fat casserole cookery as you learn preparing a yummy Chicken Enchilada Casserole. And if you've given up deep-frying because it's too high in fat, you'll love this lesson’s recipes for Oven-Fried Chicken, Oven Fries, and Oven Onion Rings. You'll be licking your fingers because these recipes taste so good—not because they're greasy! If you prefer to cook rather than clean, you'll love the tips and tricks that will be discussed in this lesson! This lesson will examine how to organize and take control of the pantry, kitchen, refrigerator, and freezer. This lesson will share with you some kitchen cleanup tips, too. Once you've got things organized and tidy, this lesson will share what is called cupboard meals. Fall back on these family-favorite recipes when you're pressed for time—Chicken Florentine Pasta, Speedy Lasagna, and Quick Chicken Risotto. This lesson will revisit flavor profiling and discuss another way it can benefit you when you prepare Caribbean Chicken Pizza. And, you'll learn to use the Crock-Pot to prepare Mexican Pork, a simple but delicious twofer recipe. In this lesson, you'll learn how to keep cool as a cucumber on the hottest dog day of summer as you prepare Summer Seviche, Gazpacho, and Chicken Caesar Pasta Salad. You'll find out how to use your small kitchen appliances to make Best Pizza Dough, Tomato-Olive Bread, and Chicken and Wild Rice Casserole. And you'll beat the heat while grilling up Grilled Margherite Pizza, Grilled Veggie Medley, and Grilled Fruit Cups. These summer-perfect recipes are so scrumptious, though, you'll want to enjoy them year-round! Bring your sweet tooth to this lesson! You'll have several opportunities to wow your taste buds, as you'll prepare Very Cherry Cake, Tofu Key Lime Pie, and Peanut Butter Cup pie. You'll learn how to choose and make tasty, colorful lowered-fat side dishes, including Fruit Salad, Asian Coleslaw, and Green Beans and Bells, as well as a variety of garnishes. This lesson will talk about one last hurry-up technique—how to break the rule of mise en place. To close out the course, this lesson will discuss the basics of evaluating nutrition research.